Now that or phones can take high quality, high definition video, less people are purchasing handheld camcorders. But for those in the know, a dedicated camera is still, by a large margin, the best way to get near-production quality video without breaking the bank. Really, what our phones have done is set a new standard for what a decent camcorder needs to do. If you buy the wrong unit, you’ll be stuck with something that doesn’t really provide any benefits beyond what you already have in the palm of your hand. Most photographers know that Canon is a brand that you can trust to produce high quality photographic equipment, and the HF R800 is the latest in an upper-midrange line of camcorders that come close to production quality, but are available at a much more affordable price. We’ll be taking a look at it to help you determine if it’s right for you. While we’re at it, we’ll give you a detailed overview of the features, and help you understand how it compares to others. It’s been a while since we got to take a look at a high-end camcorder, so we opened the Canon VIXIA HF R800 like a kid on Christmas morning. If it’s been a while since you’ve used a camcorder, you’ll be as impressed as we were with the new styling. The unit itself is shaped more like an elongated cylinder. It’s extremely compact and feels good in the hand. There is a very thin bezel on each side. The left side folds out into a large screen display, making it easy to see how your photos are being framed. The right is, for the most part, reserved for the internal components. While you don’t see much from the outside, it’s these specialized components that make for one impressive camcorder, as we found out. The defining feature of any camcorder is how good the video looks. You could compare the HF R800 to any model made just a few years ago, and it would be one of the best on the market. Although there are many expensive specialty cameras reserved for people who need specific functions, the R800 still holds its own against many of them. In ideal lighting conditions, the videos we took were good enough to put straight on a Blu-Ray disk. We found that they were extremely clear, with very little noise or distortion. When you consider that this is a 1080p camcorder, the image quality is almost surprisingly detailed. Most competing models on the market might produce video with a resolution of 1080p, but very few actually have image sensors that are capable of capturing the world with the same level of detail. The end result is an image quality that seems just a little fuzzy, as if you are looking at the world through someone else’s glasses. But the R800 captures even the finest details of the world around you. The edges of leaves, blades of grass, and the shape of clouds rolling by are all very well defined, even when the subject is something else. 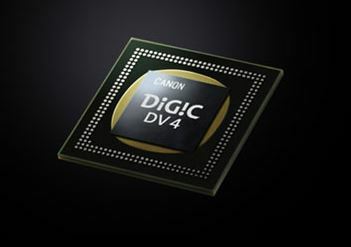 For this, we can thank the high-quality optics and the DIGIC DV 4 Image Processor. This unit is based on the same image processor used for Canons DSLR camera line, but with special modifications that make it ideal for video. When an image sensor is giving a signal back to the processor, most of this signal is the true image while parts of it are noise. The thing with noise is that it’s random. When your image is reasonably stable (which it will almost always be unless you shake it around vigorously) the image processor is able to mathematically determine what parts of the signal is noise, and cancel it out. The end result is one of the sharpest, smoothest video we’ve seen. Even in dark and challenging conditions, the R800’s performance was extremely impressive. How “zoomed” in an image appears depends on the distance between the lens and the focal point. On this particular camcorder, 75mm is roughly equivalent to what the human eye sees. The larger this number, the more zoomed it is. When it’s zoomed out, this is known as a “wide angle” field of vision. It can go as low as 32.5mm. This is bordering on what they call a “fisheye” lens. It doesn’t quite give a 180-degree field of view, but you’re getting as close as you can before the image starts to distort. The impressive 57x optical zoom allows you to zoom in to a focal point of 1853mm. This is one of the largest zooms we’ve seen in a camcorder. Without a tripod, zoom levels this high are generally almost unusable. At this level, even the smallest motions are turned into massive movement that makes the image seem incredibly shaky. Fortunately, the advanced image stabilization system corrects this issue. There are two ways that the image can be stabilized. The first way is optically. The image sensor is built to be on rails. An accelerometer can tell when the R800 is in motion, and the image sensor itself physically moves opposite to the camera’s motion, so the image stays flat. 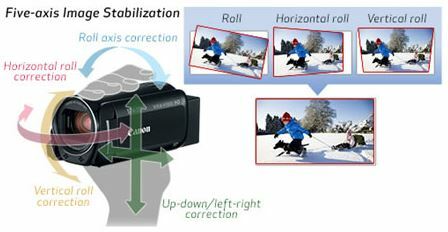 Now, optical image stabilization can only go so far. At some point, the sensor will be at the end of it’s range and cannot move any further. This is where the digital image stabilization kicks in. This zooms the image in ever so slightly and adjusts the field of view so that your image looks almost as if it’s shot from a tripod. Panning is smooth and professional. At the most extreme ends of the image stabilization spectrum, there is a barely perceptible loss of definition, but this a better alternative to having unusable footage. One of the things you’ll notice from looking at the R800 is that there is barely any controls on the unit. You’ve got the record button by your thumb, and the zoom trigger by your pointer finger. But all other controls are managed from the 3” touchscreen display. There’s just one small menu button on the display, and from there you can access an entire plethora of controls. One of our favorite functions is the highlight priority mode. This is an HDR like feature that prevents any areas of your video from being blown out. With a reduced loss of detail, more information is preserved. If you want to go for that high contrast look, this is very easy to do in post processing. The end result is something that looks incredible on a bright LCD TV. You’ll want an SD card to use with the R800. It supports SDHC cards with up to 128GB of space. At the highest quality setting, this will give you 8 hours of video. If you’re planning to upload your video to YouTube or share on the web, the highest quality settings are probably unnecessary. Want to retain 1080p? You can also shoot your video at 17 Mbps, which will double your storage space to 16 hours of video. If you drop it down to 720p (the lowest quality setting available) you can get an incredible 69 hours of footage on a single card. With most video cameras, you have to export your video to a computer in order to edit it. But the R800 has a built-in video editor that lets you make visual changes, crop, or edit out unwanted sections of video. This means that you can film almost as much as you want, and still keep your storage space open. The R800 is certainly an impressive model, but it’s sold at an awkward price point. When you’re getting into this range, consumers tend to expect the best. We would have liked to see 4K resolution, and an included SD card. Instead, Canon produced an excellent 1080p camera instead of an average 4K camera. 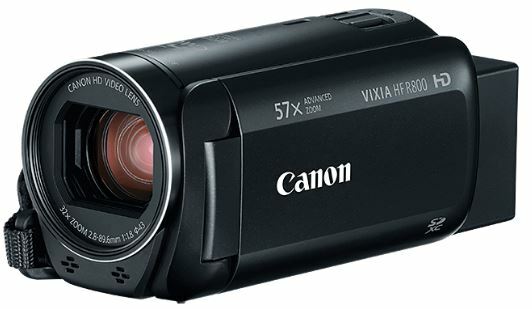 Is the Canon VIXIA HF R800 Right for Me? 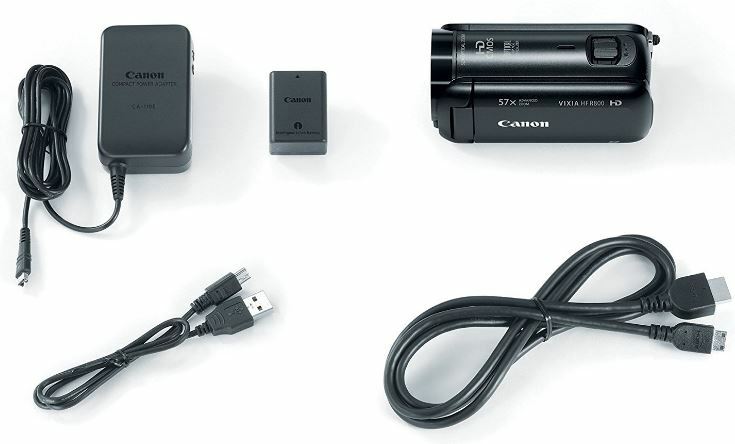 If you’re looking for a top-notch 1080p high-definition camcorder at a reasonable price point, you can’t go wrong with the Canon VIXIA HF R800. It’s designed for people who want to produce professional looking video without having to spend a long time learning the ropes. The built in image stabilization, color correction, and adjustment settings help to address the most common issues before they happen. For the most part, this is a “set and forget” type of camcorder where you can just point it at your subject, and shoot video that can last a lifetime. I need a small camcorder, but it must have manual focus, manual exposure and manual white balance control. It has to take filters (I’ll be putting close up lenses on it). It also has to run off of A/C via the power pack as it will be used on a tripod in a studio situation. I need small due to a very limited working area. You can see the fly fishing/tying videos I’m producing with it on the home page of my website. I’m currently using a Canon G10 with close-up lenses for the job and it’s simply too big. Just wondering – I can’t find anything anywhere that says definitively if the R800 has WiFi or NFC connectivity (which makes me think it doesn’t). Yes? No? Nope – it doesn’t have NFC or WiFi connectivity. Is the Vixia HF R800 compatible with Final Cut Pro X Editing Software? Would I be able to record and live feed to overflow room (via hdmi outpout) simultaneously? Also planning to hook up lapel mic of presenter to mixing board to do di box to camera for better audio quality. Will this work? Yes you can record and live feed via the hdmi and the mic can be plugged into the input port and fed via the live feed through hdmi as well. Not mentioned is the difficult to access switch on the right side of the camcorder which manually opens and closes the lens cover. Poor design. If the lens cover does not open automatically when the screen is flipped out, then at least the switch should be on the left side of the body behind the LED screen. I feel the need to mention that the Canon R800 series camcorders are basically the exact same thing as the R700, R600, R500, R400, and R300 series camcorders. The differences between models are only that the oldest ones have a 53x advanced zoom instead of 57x (though the purple fringing at full optical zoom is really bad regardless) and the two-digit models have variance in support for Wi-Fi, NFC, and amounts of internal flash memory. I have done comparisons on all of the details and everything from VIXIA HF R3 to R8 series has the exact same sensor, output frame rates and bitrates, optical zoom, flip-out LCD controls….ALL OF IT. Canon is notorious for bumping camera model numbers with no significant changes to the offered equipment. They do this with the Rebel DSLR series a lot; each model generally only offers incremental improvements over its predecessor. In the case of these camcorders, however, they have literally not changed since 2012 in any aspect other than the model number painted on the side and the retail price increase for each “new” number increment. To be fair, I own an R60 and it helped me get [re]started in filmmaking and video work. 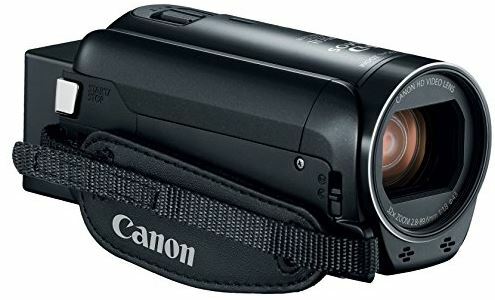 It’s not a “pro” level camcorder by any means, but if you are looking for a cheap starter camcorder you really can’t go wrong with this series, especially now that you know an R300 is the same thing as an R800 and can buy them used. I just found an R300 on eBay for $85. Now that’s a good deal! Of course, new stuff comes with a warranty and there may have been marginal improvements in the image processing, optical stabilization, and sensor behavior since the R300, so take all of this with a grain of salt. I had a terrible time trying to connect to Windows 10 pc so I can upload my movies to my pc and delete my SD card and start over. Can someone help me? I take the SD card out and put it in an SD card reader, connect that to my Windows 10 computer, and copy (or “move”) the files to the computer’s hard drive. By doing that, the Windows File Explorer can be used to copy, delete, etc. the files. Anyway, one question, my R600 had the capability of choosing a recording format of AVCHD or MP4. I noticed they dropped the AVCHD. Do you have thoughts as to why? Thx! What about battery life? Is there a port where an external battery can be plugged in? As with most mid-range camcorders there is a slot on the back for the BP-727 lion battery. Is there a remote trigger available. Does it have the ability to take still shots as well? Yes you can use an external mic. How would the Canon HF R80/82 perform for recording church worship services/sermons? Is it compatible with Windows and Apple computers (iMovie)? If using an external shotgun mic how would one mount the mic (I do not see a shoe)? Thanks for the help. 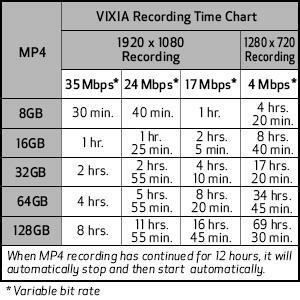 You can edit on any computer or software that can handle MP4 1080/60p. There is no mounting assembly for an external mic. You would need to mount it separately to your rig or maybe Velcro to the top of the camera. Are you able to use a remote control or wired controller with this model? I can not find a way to just take a picture – recording is easy. What is the trick? The equavalent of this camcoder in South Africa is the Legria R806. Given the price this is a fantastic camera and sell for around R3000 (337 American dollars). Don’t like that I cannot use a remote control with this cam.